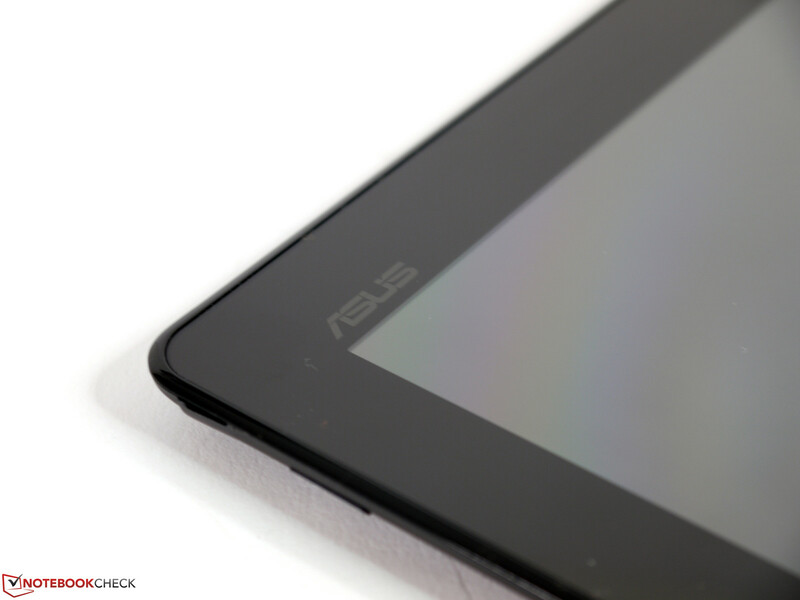 Asus has a fairly vast portfolio of tablets based on Windows 8 in its range. 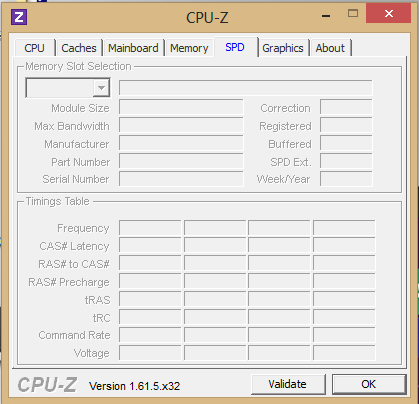 Windows 8 with the supplement "RT" has to be discerned as it represents a special version for devices based on the ARM architecture. Although the functions, looks, etc. are virtually identical, standard Windows programs and not all hardware peripherals can be used. This is all a bit simpler with our test device. 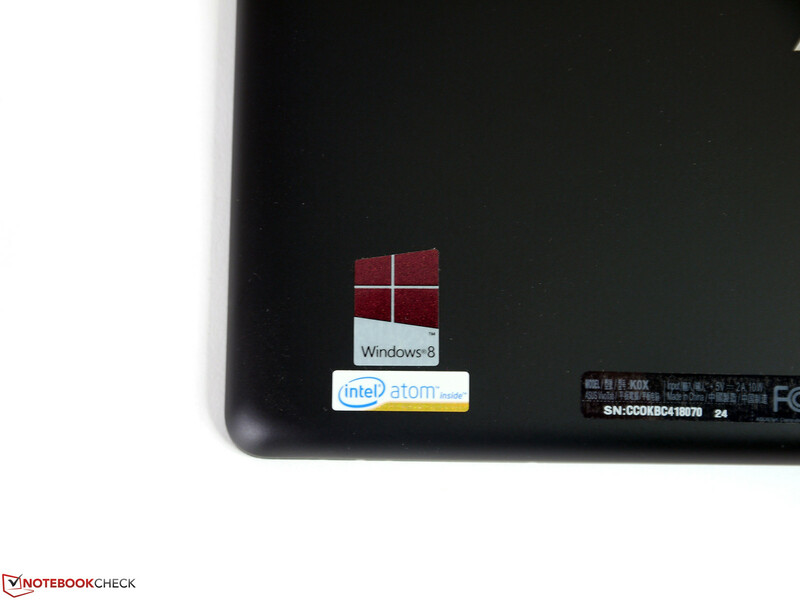 Intel's Atom Z2760 CPU is used as the processor, which is based on the Windows compatible x86 architecture as usual. That theoretically enables using all Windows programs as well as all existing peripherals, such as printers, scanners, hard drives and Blu-Ray players without needing an additional app or special drivers. 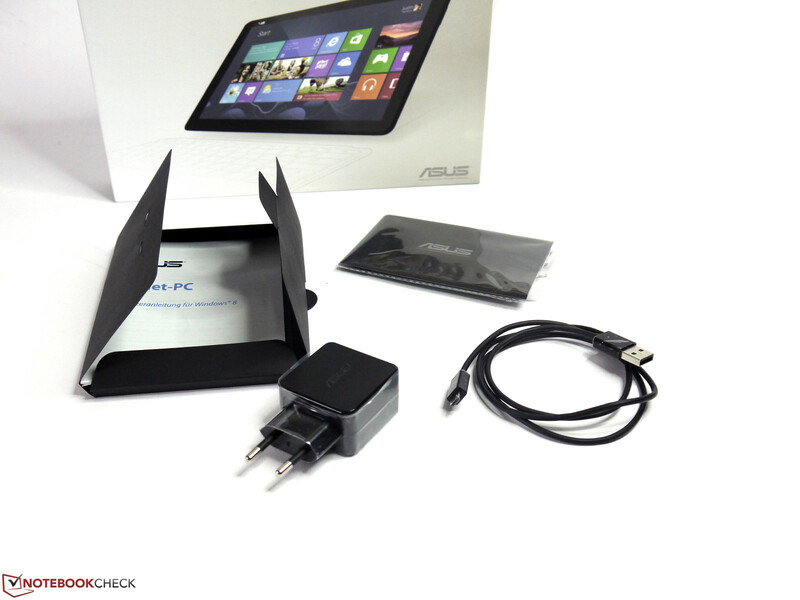 Asus' VivoTab is currently the cheapest Windows 8 member in the Taiwanese manufacturer's tablet portfolio. The tablet is sold for approximately 500 Euros (~$668). 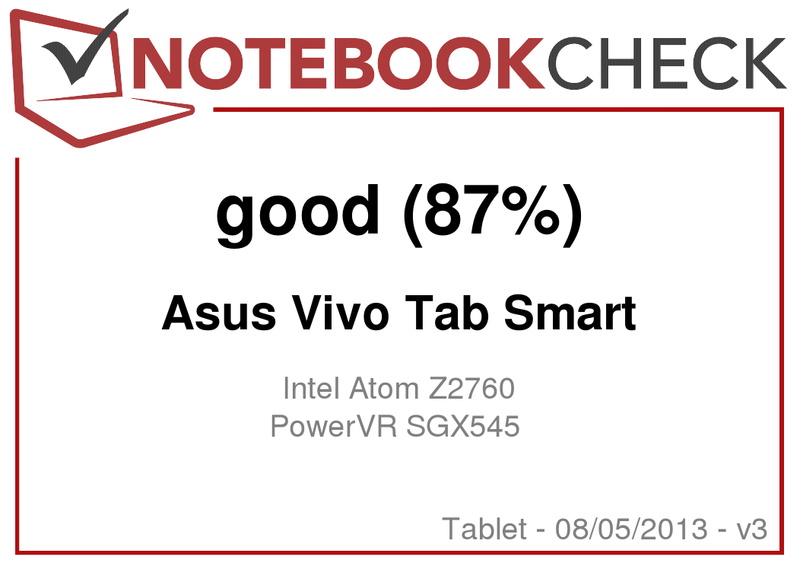 Besides Intel's Atom Z2760 CPU, the VivoTab Smart sports 2 GB of LPDDR2 working memory, a 64 GB eMMC flash memory, an SGX545 graphics unit from PowerVR and a 10-inch IPS screen with a HD resolution of 1366x768 pixels. Black is beautiful. The casing is clad completely in black and conveys a very discreet impression. 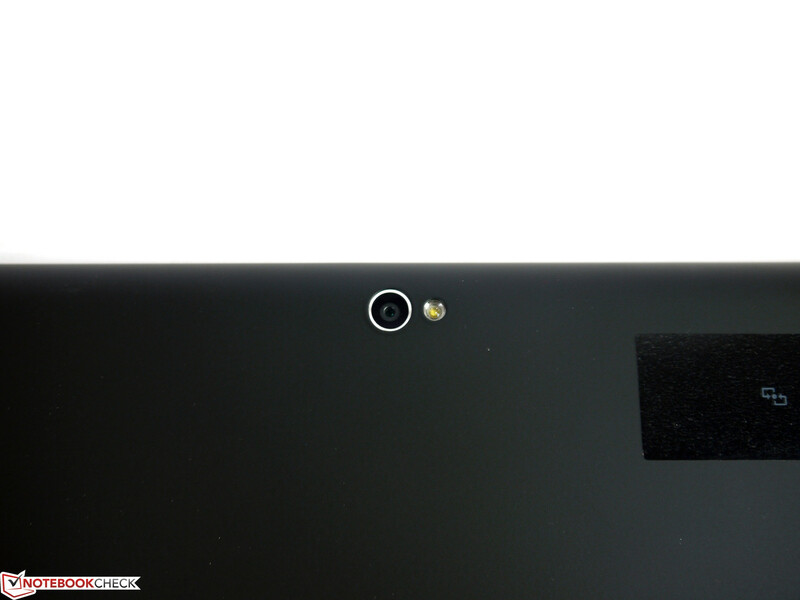 Only the 8 MP camera on the rear has been adorned with a thin chrome ring and is a small eye-catcher. The back features a light rubber coating and consequently a secure grip. 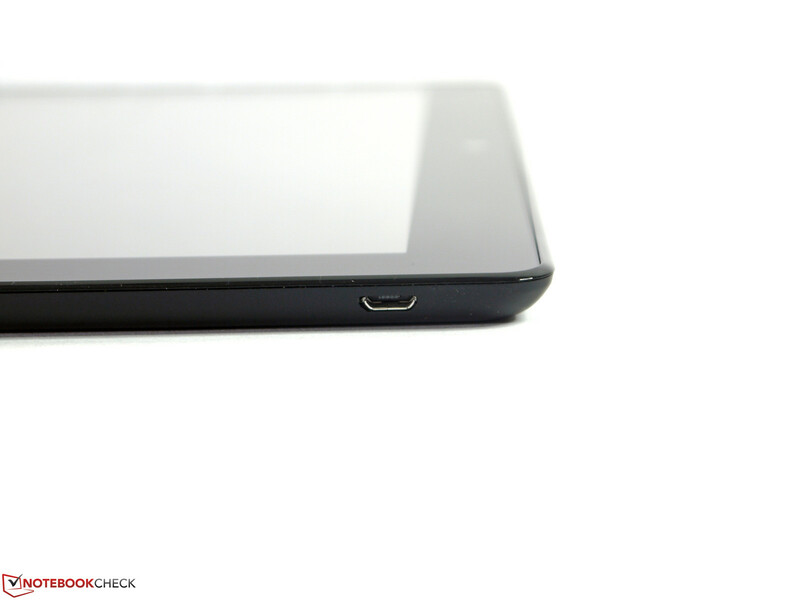 The 10 millimeter tablet is comfortable to hold. Its weight of 570 grams is acceptable and is within the same range as many 10-inch contenders. 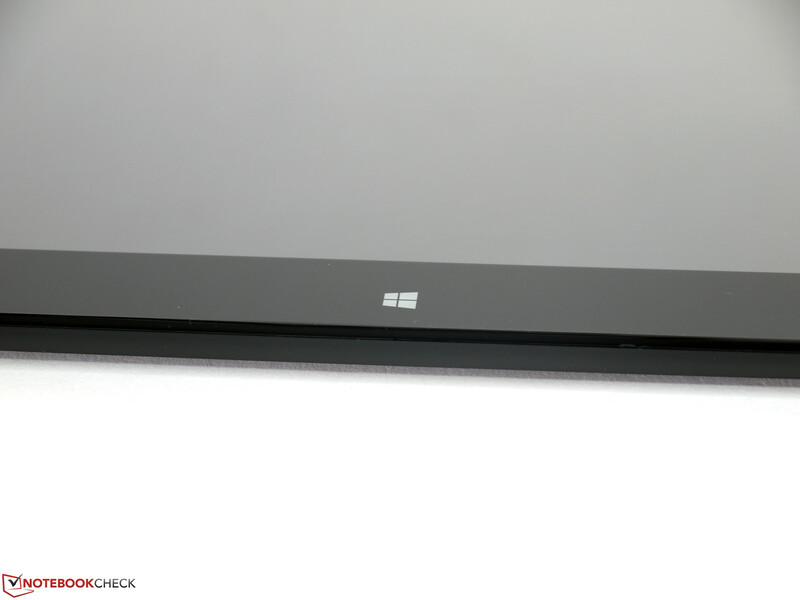 The screen side is a big glass surface that takes up the casing's entire width. 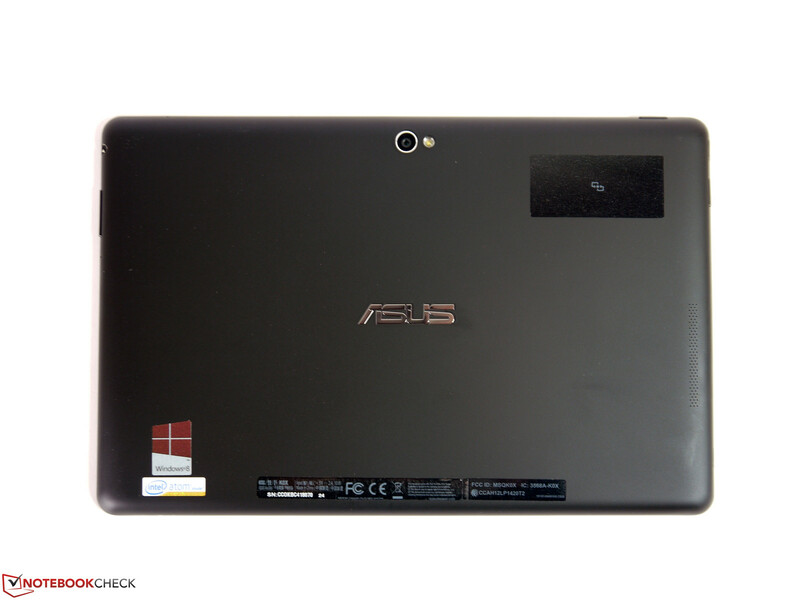 Besides the 2 megapixel webcam, the brightness sensor and the Windows sensor button, the black frame exhibits an unobtrusive Asus logo in the upper left corner. All of this is enclosed by a narrow, glossy black frame. 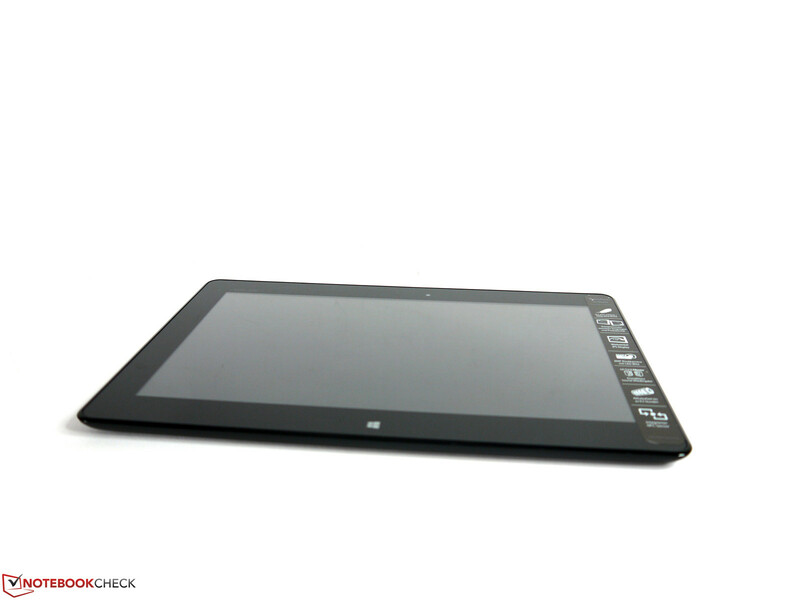 The casing's stability is good although it cannot compete with contenders like the iPad 4 or Asus' Transformer Pad TF700T. The casing only warps marginally and responds to this with a quiet creaking noise. Asus' VivoTab is also available in white. 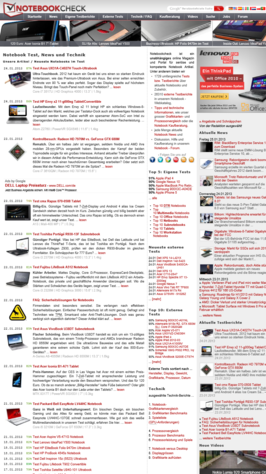 There is even a red version mentioned in the specs on Asus' US homepage. 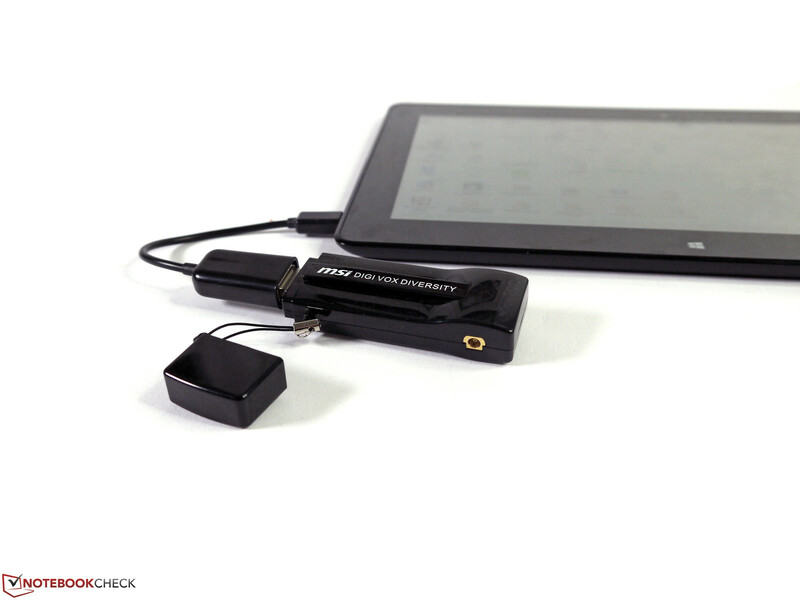 The VivoTab Smart can be connected to various peripherals via the optional USB adapter. The connectivity covers the usual scope. 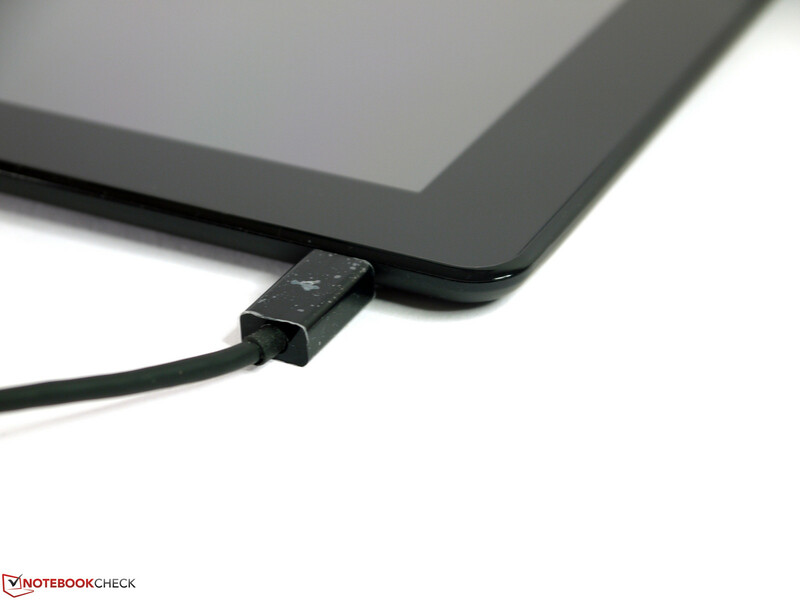 External monitors can be connected via the micro-HDMI (cord not included), the micro USB port can be used for recharging the tablet or connecting peripherals (cord included) and the memory can be expanded using a micro SD card. Handling the small interfaces is very tricky due to their design and requires some patience. The HDMI port's cover proved to be quite stiff and is quite difficult to open with short fingernails. The user has to take special care that the memory card does not fly out when removing it from the micro SD slot. The spring mechanism's tension is quite high and can occasionally thrust the memory one or two meters out of the slot. A combo audio jack is installed. Audio devices with two dedicated cords, such as headsets, need an adapter. The interface distribution and positioning did not reveal any drawbacks in the test period. Just the 95 centimeter long USB cord proved to be a bit short when the tablet was used and recharged at the same time. Asus' VivoTab Smart ME400E features Wi-Fi, Bluetooth 4.0, a 2 MP webcam and an 8 MP camera on the rear. 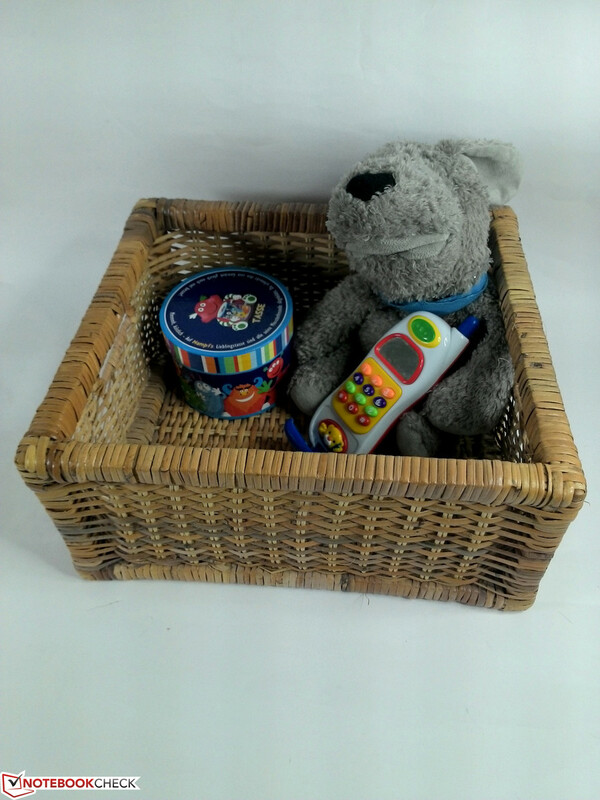 While the front-facing camera is sufficient for Skype & co, it is possible to take product pictures for online auctions or simple shoots on the go with the somewhat better 8 MP camera. The Wi-Fi connection did not exhibit any irregularities and is comparable with an iPad 1. A signal strength of 2 bars was still available at a distance of about 10 meters in an apartment with several partitions. NFC (for e-payment) or e-compass are other fields of application. 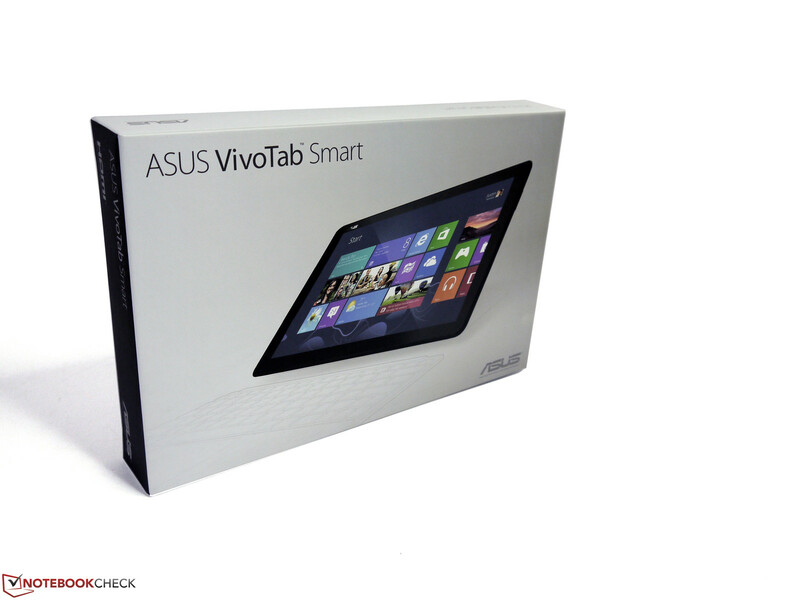 Asus' VivoTab Smart ME400CL has been announced for late January for approximately 600 Euros (~$801). It additionally offers a 4G/LTE module for mobile internet connections. Asus has reduced the packaging to a minimum and consequently not many accessories fit in the box. The space was still enough for the PSU with USB cord and a microfiber cloth. An HDMI cord or USB dongle is not included. 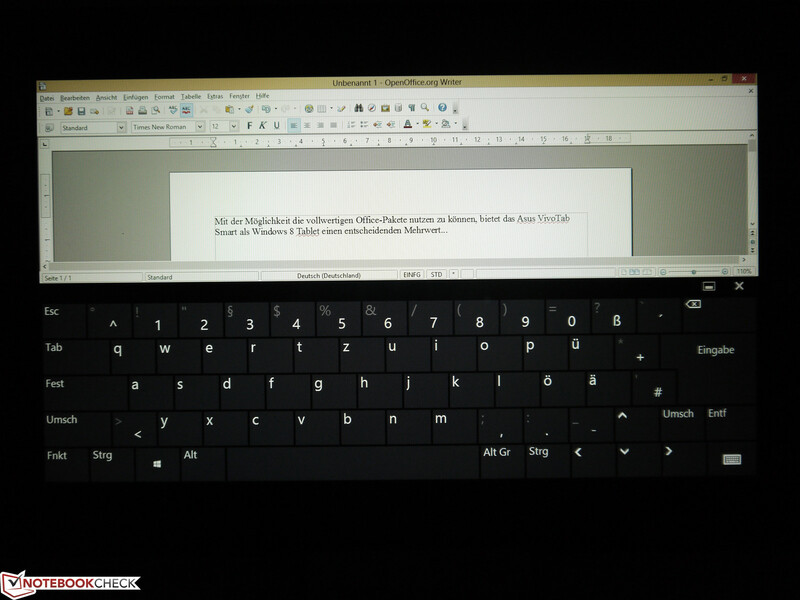 An optional Bluetooth keyboard for the VivoTab Smart is to be available after the publication of this review. Its price will be around 110 Euros (~$146). 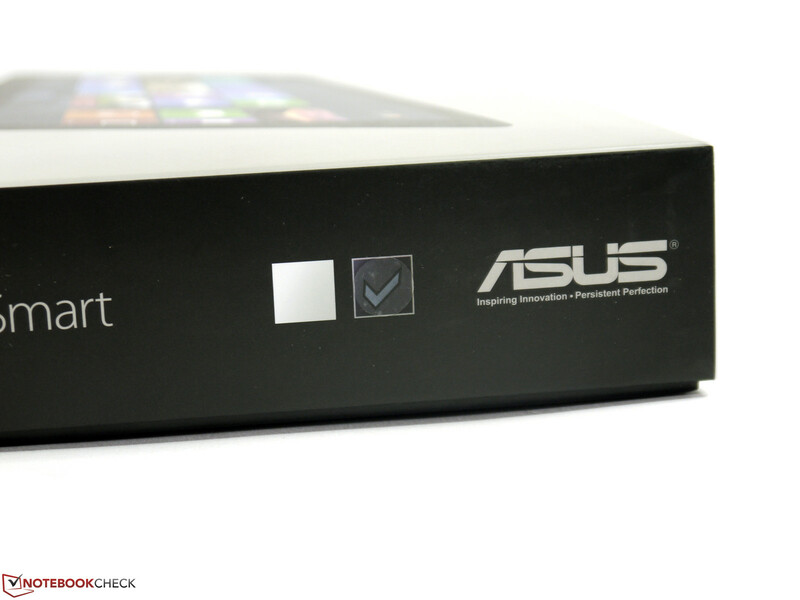 Asus includes a 24 month manufacturer warranty. An upgrade to 36 months is available for 69 Euros (~$92) for the country in which the tablet was purchased and 79 Euros (~$105) with international validity. 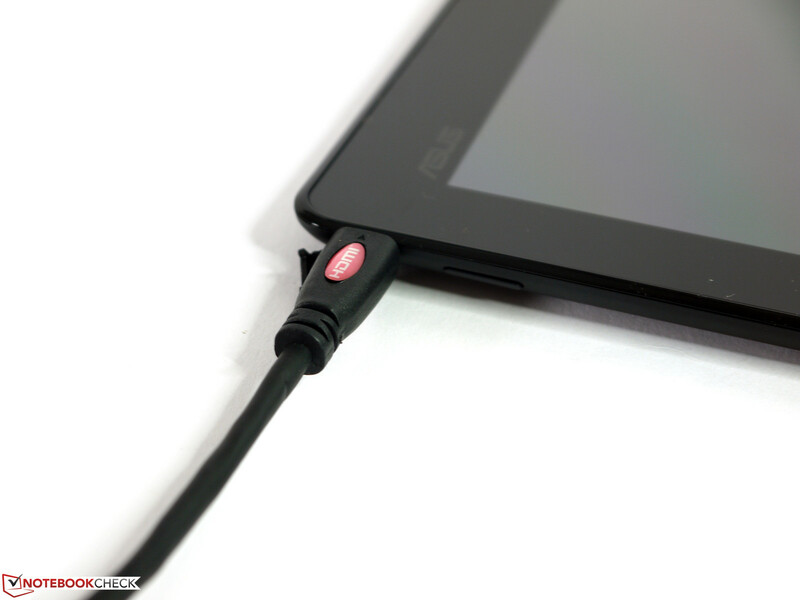 The capacitive touchscreen in Asus' VivoTab Smart accepts inputs very reliably. The accuracy and the hit ratio are very good even in the desktop mode of Windows 8 and rarely leads to typos. The touchscreen's gliding traits are also decent due to the sleek surface and support the usual multi-touch gestures well. 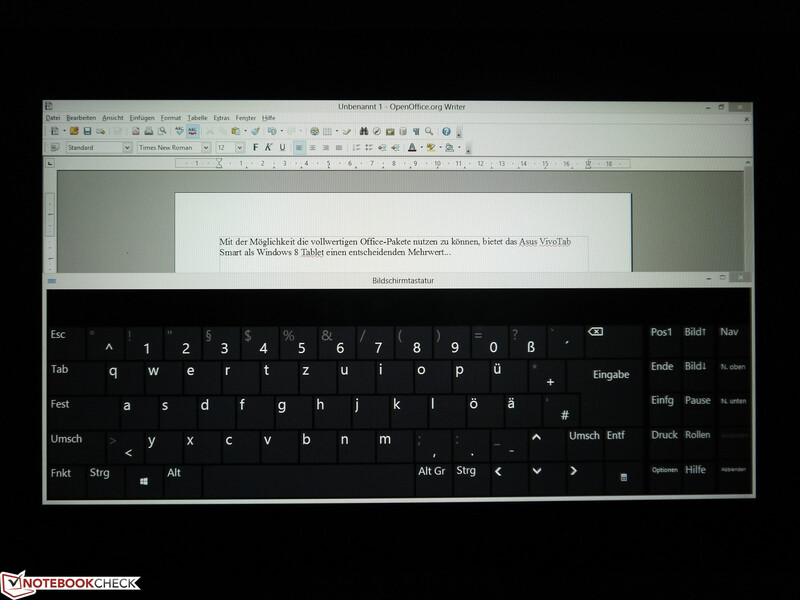 In return, the available virtual keyboard needs familiarization. 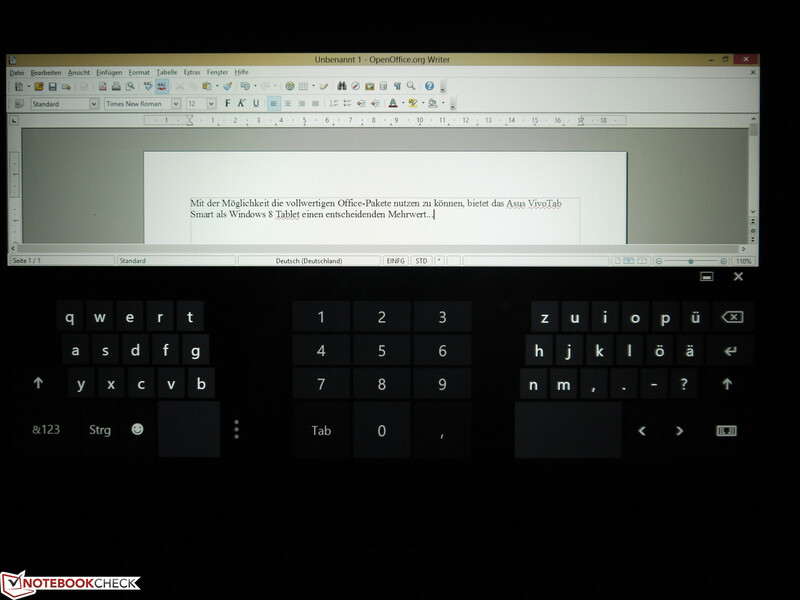 Some elements that would be expected on a Windows 8 keyboard are either a bit nested or missing. When required, the key field can be divided, moved or pinned. 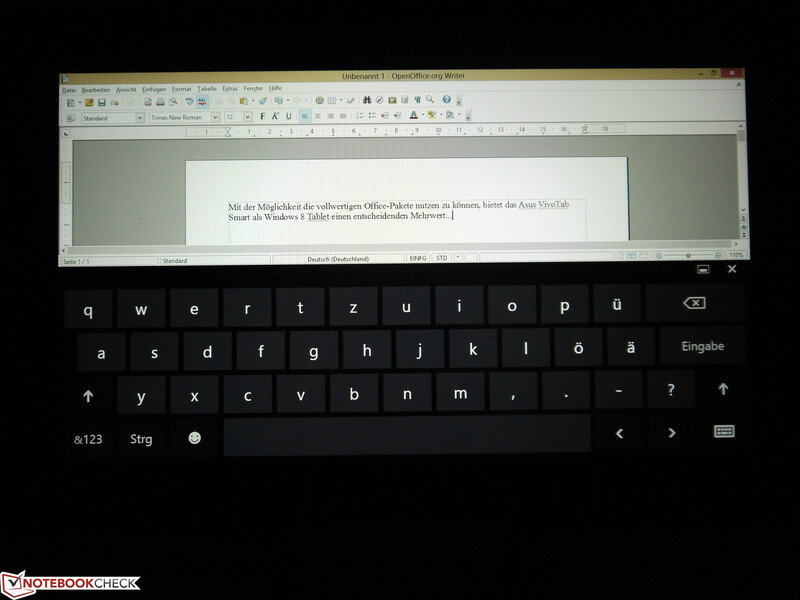 A complete keyboard can be found a bit awkwardly in the accessibility tools. It can be infinitely resized and offers all standard features. The hardware buttons on the casing are rather narrow, are inserted quite deep and could feature a more precise pressure point. The use is still quite acceptable and the minor drawbacks can be tolerated since they are not used as frequently. 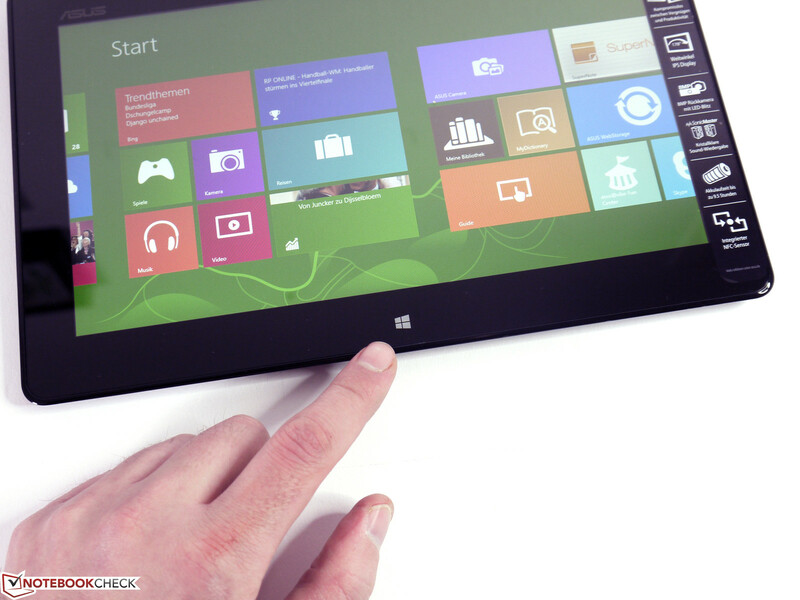 The sensor button in form of the Windows symbol at the screen's lower edge enables fast switching between the Metro interface and back. Screenshots can be made in combination with the volume down button. The sensor recurrently did not respond to any inputs for a few minutes in the tests, only to work perfectly again afterward. The 10.1-inch IPS LED screen features a resolution of 1366x768 pixels which results in a pixel density of 156 dpi. The representation is quite fine but not too small. Also, it is possible to increase the icon size, letters and symbols to 125%, which should not be necessary in most cases. There is plenty of room on the desktop in landscape mode and websites or documents can be read and edited very comfortably without much vertical scrolling in portrait mode. 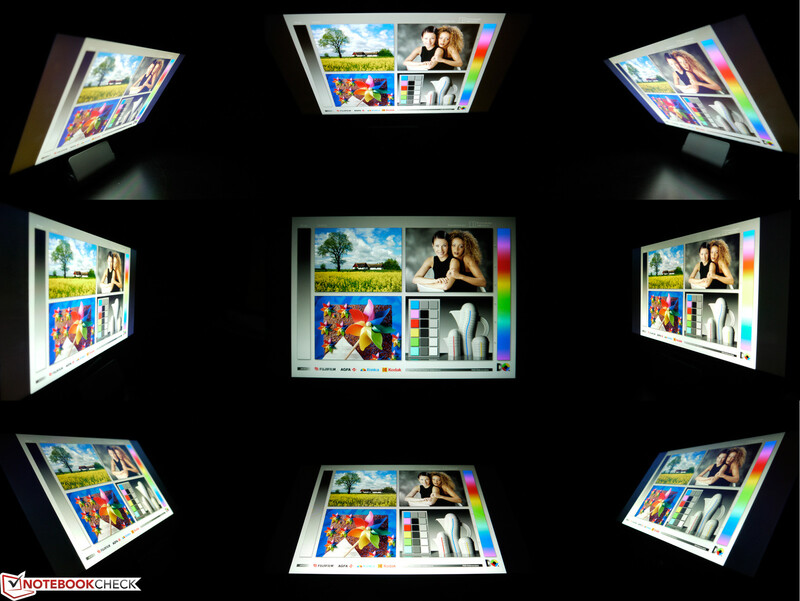 We ascertained the maximum brightness of the IPS screen from AU Optronics at 9 measuring points. Rates of 316 cd/m² in the lower right corner up to 394 cd/m² in the center result in an average of 357 cd/m². The homogeneity of the screen's illumination is just 80% due to the two extremes. However, a brightness difference is not seen even on a monochrome screen. The tablet sports a brightness sensor that quite acceptably adjusts the screen's brightness to the ambient light conditions. This feature can be deactivated in the energy options under the item "enable/disable adaptive brightness". We could not perform a contrast assessment due to driver issues and incompatibilities between the gauge and PowerVR graphics. 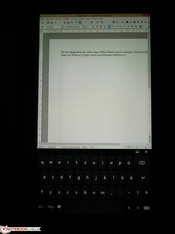 However, the contrast is on a similar good level as an iPad 1 in a direct, subjective comparison. The color reproduction is a bit cooler with a slight tendency to blue. A color gamut assessment could not be performed for the same reasons as mentioned above. As usual for an IPS screen, the viewing angle stability is within a very good range. 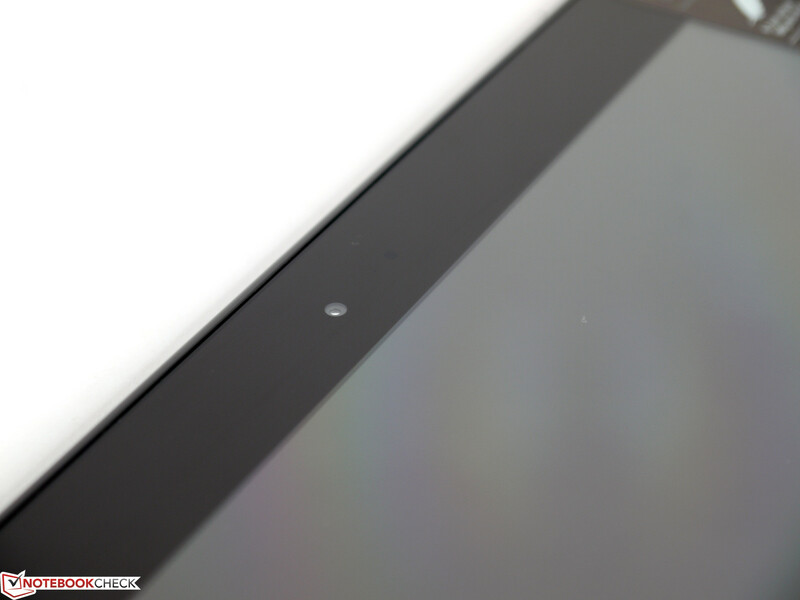 It exhibited a slightly smaller viewing range in an extremely acute angle in a direct comparison with the iPad 1. However, this is unimportant for routine use. Overall, Asus has installed a good screen that can compete with higher priced models. It is only defeated by some contenders in resolution and maximum brightness. While the ARM technology dominated the tablet sector during the last months and years, Intel has now launched an equally energy-efficient alternative on the market. Intel's Atom CPUs from the Cloverview generation are specified with a TDP (thermal design power) of 1.7 watts and designed for a particularly low consumption. Like in the prior Atom CPUs from the Z range, a graphics solution from PowerVR is used in the latest model family. It is known for especially low power consumption. 2 GB of LPDDR2 RAM is installed as the working memory and the storage device is implemented as a flash memory in eMMC memory card format. There are currently no alternative performance configurations available. Intel's Atom Z2760 dual-core processor provides a maximum clock of 1800 MHz and can make use of Hyper Threading technology. Consequently it is possible to process up to four threads at the same time. The Atom Z2760 CPU's 64 bit capability has been clipped for energy saving reasons and Windows 8 is only available in the 32 bit version. The chip is cooled passively so it does not need a spinning fan. The processor's power is actually no longer state-of-the-art and proves to be almost unsuitable in a few areas alongside Windows 8. 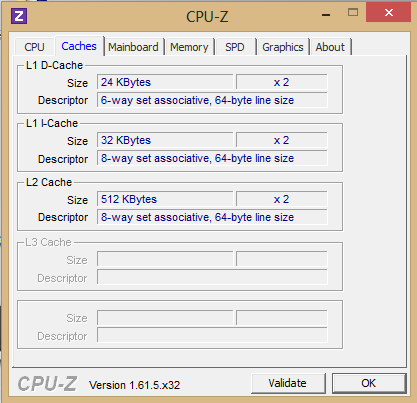 However, since it is a tablet PC and other tasks are demanded from it, categorizing the pure CPU power based on the usual criteria has to be put into perspective. Nevertheless, we do not want to withhold the few benchmark results. The wPrime 1024m calculation benefits from the four simultaneously usable threads and finished after 1691 seconds. 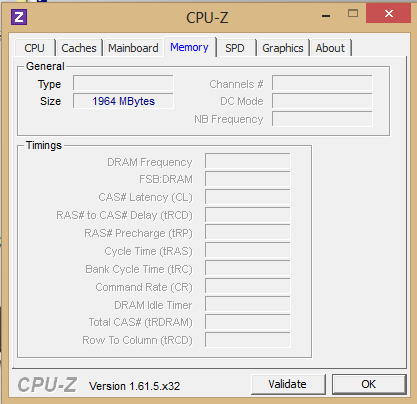 That is still on a par with the desktop Atom D525, which consumes a lot more power with a TDP of 18 watts. A single-core score of 601 points and a multi-core score of 1704 points were achieved in Cinebench R10. As mentioned above, the results are at the lower end of our extensive CPU benchmark chart and do not leave much room for a smooth workflow. Of all performance demanding tasks, we could at least perform audio conversion via iTunes in practice. The Atom CPU's conversion speed of x8.1 places itself just behind AMD's Fusion E-300. Consequently, audio converting is possible but is also very time-consuming depending on the complexity. 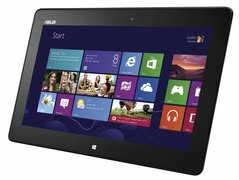 The biggest advantage of Asus' VivoTab Smart featuring the standard Windows 8 is the software availability, which is only limited or not at all available in Android or iOS. In this group of long-awaited applications for the tablet sector are, for example, the office suites from Microsoft Office or Open Office. Short texts, editing and additions can be implemented here without having to worry about formatting, compatibility and subsequent revising. The system's performance is easily enough for such work and does not exhibit any bottlenecks. Another advantage, which particularly concerns graphics, is the capability to accelerate video rendering via GPU. 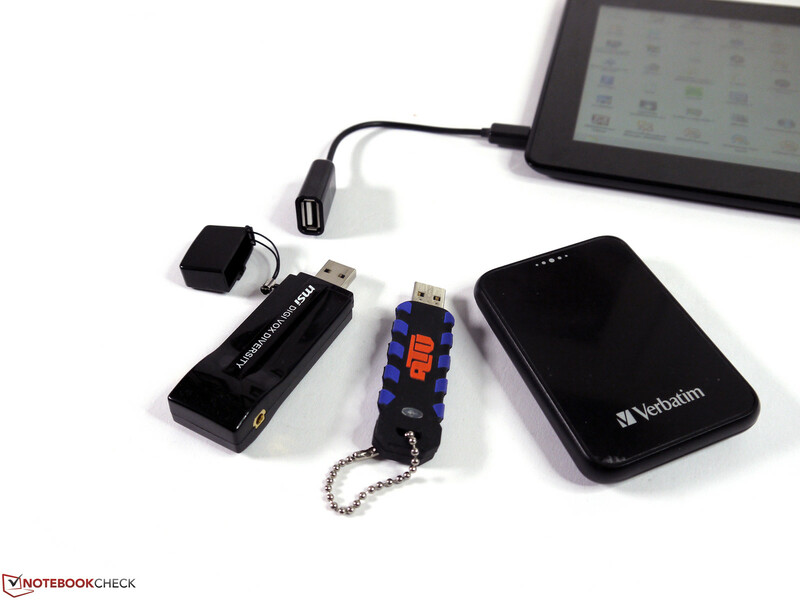 This enables playing Full HD material smoothly on an external TV or monitor. Enough power is also available for receiving television channels via DVB-T. We tried this using Elgato's Tivizen Wi-Fi DVB-T receiver and experienced a permanently stutter-free picture. However, a few programs cannot be used because the tablet simply does not have enough power or because the graphics card does not support DirectX10 or higher. Even the latest version of Cyberlink's MediaEspresso refused to work. Updates and driver optimizations could however lead to a solution in the medium term. 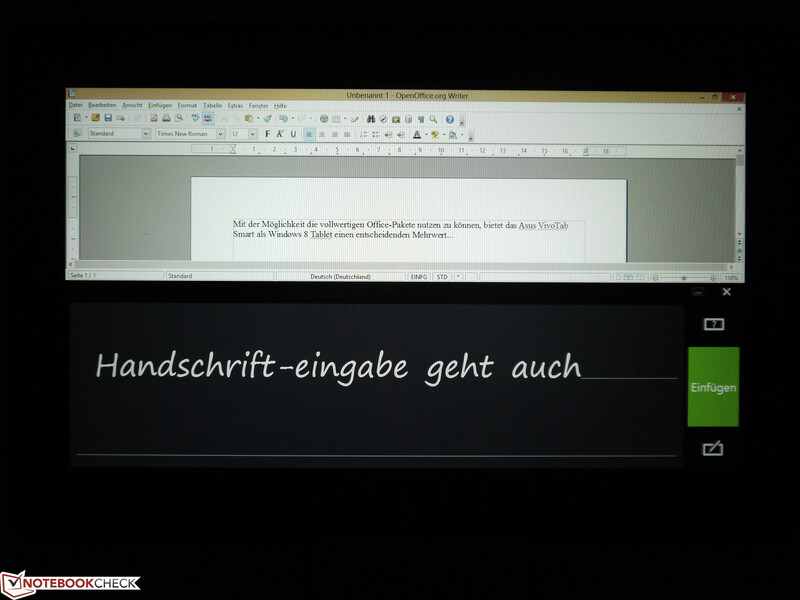 Optimized apps for tablets based on Windows 8 are rarely an alternative because they are still quite scarce. A major task for Microsoft is to quickly provide a large supply. 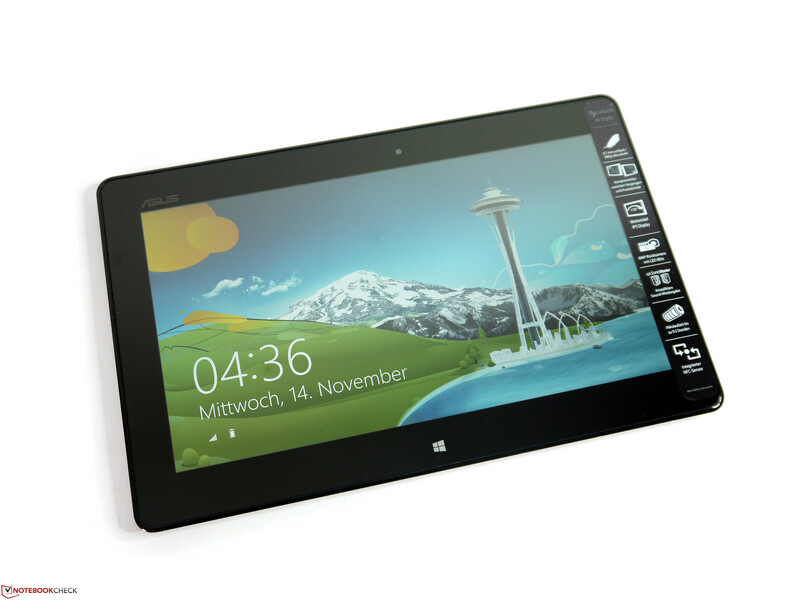 The performance of the economically designed Windows 8 tablet can first be exhausted in the gaming and converting field with modified programs. The power of the system performance is difficult to express in figures because the standard PCMark benchmarks do not (yet) work despite the latest operating system. 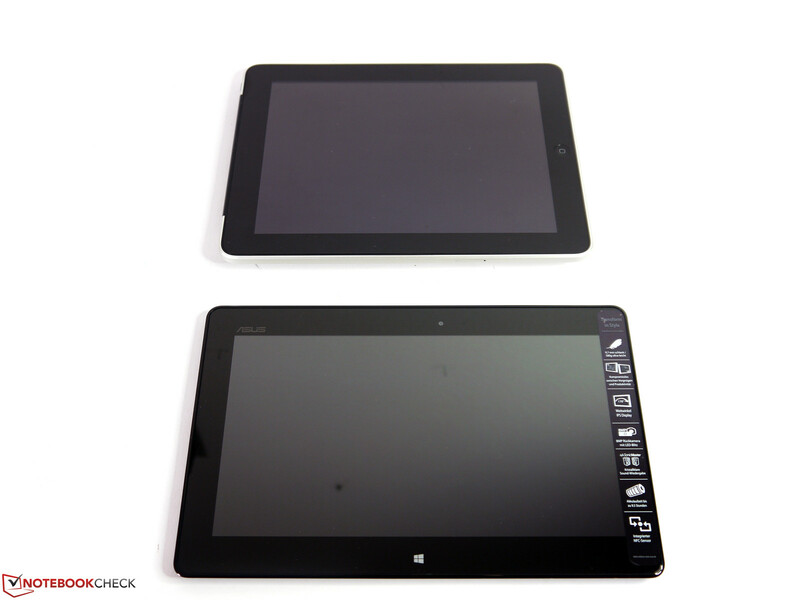 We alternatively used a part of the benchmarks that we use for "conventional" tablets. These cross-platform tools supply a certain comparability with tablets based on Android, Windows RT or iOS operating systems. 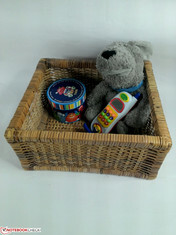 The browser benchmarks Google V8, Sunspider and Browsermark as well as Geekbench, which is available for many systems and assess the CPU and working memory, belong to these. 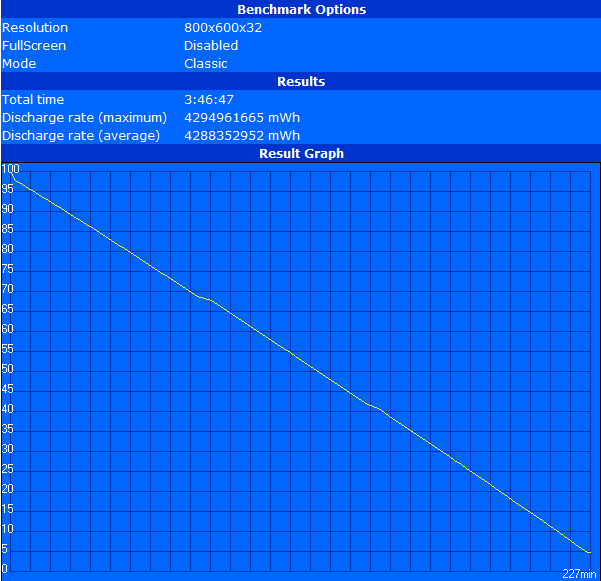 In contrast to the sobering benchmark scores, the subjective impression while working with the Windows 8 tablet is very good. It is possible to smoothly glide through the tiles, switching between the levels is fast and the browser ensures quick scrolling. Technically, the tablet works smoothly and the responsiveness is on a par with the iPad, Nexus & co. Just large applications, such as Terratec Home Cinema or iTunes, need a few seconds to open. The storage device is a special multimedia card (eMMC) that is tightly integrated onto the motherboard. This solution is particularly space-saving and points to a very low power consumption, which are qualities that are essential for a tablet. The ascertained transfer and performance data of the flash memory are quite acceptable in relation to the device category. A sequential read speed of nearly 80 MB/s and a permanent transfer rate of 60 MB/s maximum are enough to not be a performance bottleneck in Asus' VivoTab Smart. 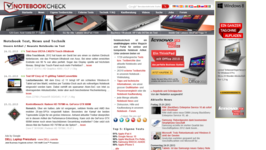 The fairly short access time of 0.5 milliseconds ensures fast responsiveness. 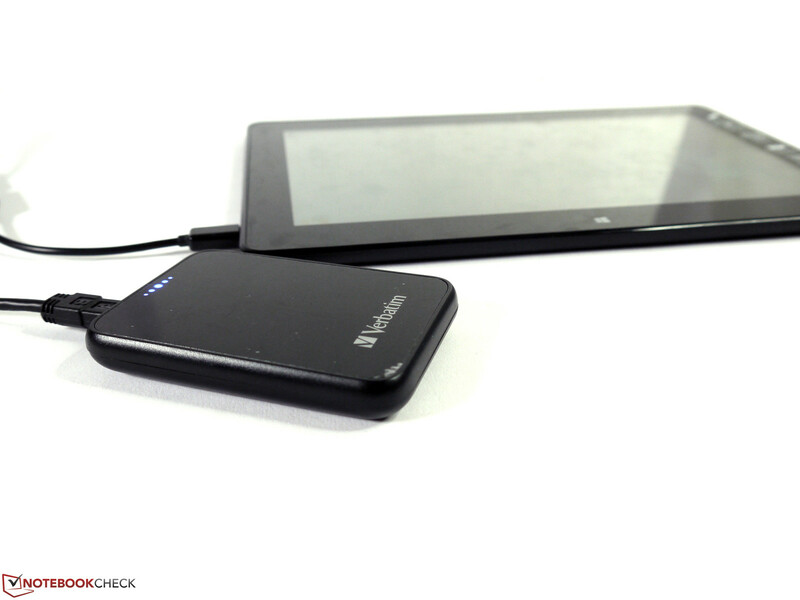 32 GB of web storage is also included for Asus' VivoTab. It can be used for 3 years at first. The memory card reader achieved a transfer speed of 22.3 MB/s with a micro SD card. Faster speeds could be possible with swifter memory media. 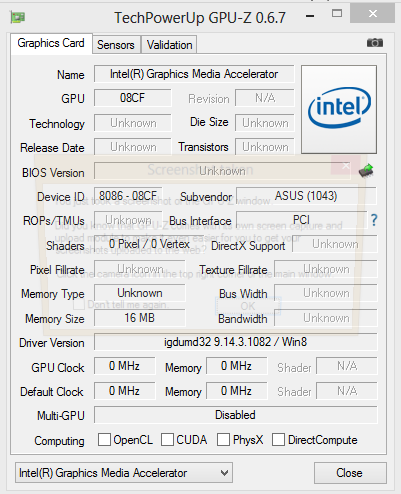 The PowerVR SGX545's graphics performance, which is simply displayed as Intel GMA, is throughout mediocre for Windows conditions. Also, the graphics interface only supports DirectX 9 which means some programs cannot be used. Most current graphics benchmarks did not even start or crashed while they were running. An extremely low 306 points was achieved in 3DMark 06 and Cinebench R10's OpenGL Shading did not surpass 434 points. Although this is enough for many applications, the user should not even consider 3D tasks. It is not possible to play any usual games on Asus' VivoTab Smart apart from classics such as chess, mahjong or solitary. We tested Anno 2070 and Diablo III on the virtually equally equipped HP Envy X2 and only achieved a poor 4 fps. Although we achieved 7 fps on Asus' VivoTab Smart with Anno 1404, it is just as unplayable. The gaming apps from the Microsoft Store will likely run better, but we did not try them. The casing's temperature achieved a maximum of 47.2 °C during longer "full load" via Furmark and Prime95. This is a noticeable condition but it is not perceived as unpleasant. Otherwise, the casing's temperature stayed within a moderate range. The user will have to count with a temperature of around 30 °C when browsing through the internet on the sofa, but that relates to a cool tablet. (±) The average temperature for the upper side under maximal load is 35.1 °C / 95 F, compared to the average of 30.7 °C / 87 F for the devices in the class Tablet. Although the sound output, for which SonicMaster is responsible, is very treble-heavy, it supplies a bit of mids and bass. The user still gets a quite acceptable sound compared to entry-level laptops. However, the quality is a bit inferior to the iPad 1. An inexpensive sound enhancement can be achieved using external speakers, such as little cube speakers, or earphones. The relatively low power consumption supplies good requisites for a long battery life. It ranges from a minimum of 1.7 watts up to a maximum of 10.3 watts (full load including battery recharging). The system consumes a maximum of 9.5 watts from the outlet without battery recharging. The screen has a fairly large share in this. It exhibits a difference of 1.5 watts between minimum and maximum brightness. A 25 Wh lithium polymer battery is used and is, of course, not removable. There are no options for energy saving modes. Only a balanced profile is available, which does not offer much room for personal preferences due to significantly abridged setting options. The PSU is specified with a wattage of 10 watts. Recharging the battery while the tablet is in use could need some patience with a time of 3 to over 5 hours. Since the tablet automatically shut down after a while, we could not successfully perform Battery Eater's Reader's test. Not a BIOS nor driver update nor checking the usual pitfalls helped. Adding up the results we gained in the practical part, net runtimes of around 14 hours should theoretically be possible in minimum settings, i.e. minimum brightness, wireless off. Asus' VivoTab lasted for almost 8 hours with a rest capacity of 3% in the Wi-Fi test (50% brightness, wireless on). We performed Battery Eater's Classic test, using maximum brightness and Wi-Fi on, with a lot of determination and effort. The result of nearly 4 hours of net independence is impressive. Asus' VivoTab Smart is configured with a full version of Windows 8 and a decent selection of interfaces. On the one hand, that theoretically leads to unrestricted compatibility with the Windows world but on the other, the hardware requirements are also correspondingly high. 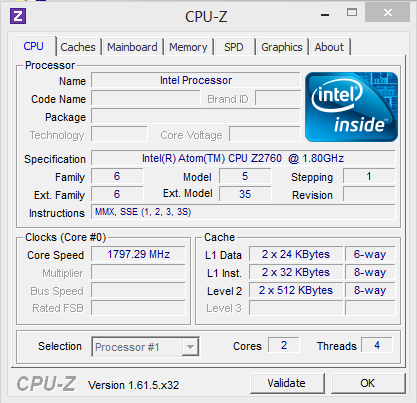 The combination of Intel's Atom Z2760 CPU and PowerVR's SGX545 graphics cannot cover this performance requirement in all fields. Office, internet, communication software, undemanding picture management and a bit of multimedia are no problem for Asus' VivoTab Smart. 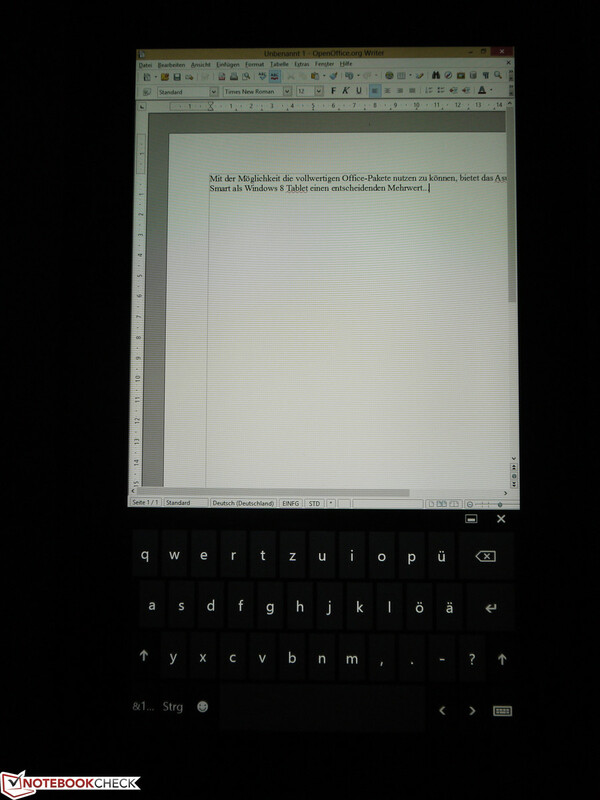 Even navigating between Metro, desktop and applications works well and smoothly. 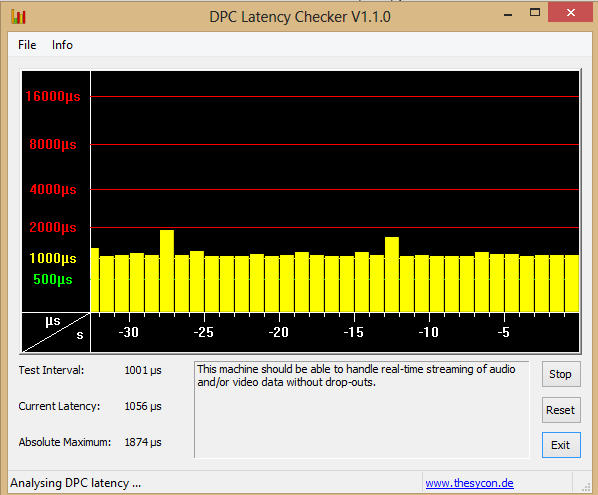 But the performance is no longer enough for other tasks, such as converting short video clips or playing games. The Windows 8 tablet would be dependent on apps specially modified for the (Atom) hardware, which is still only available to a limited extent in the Microsoft Store. 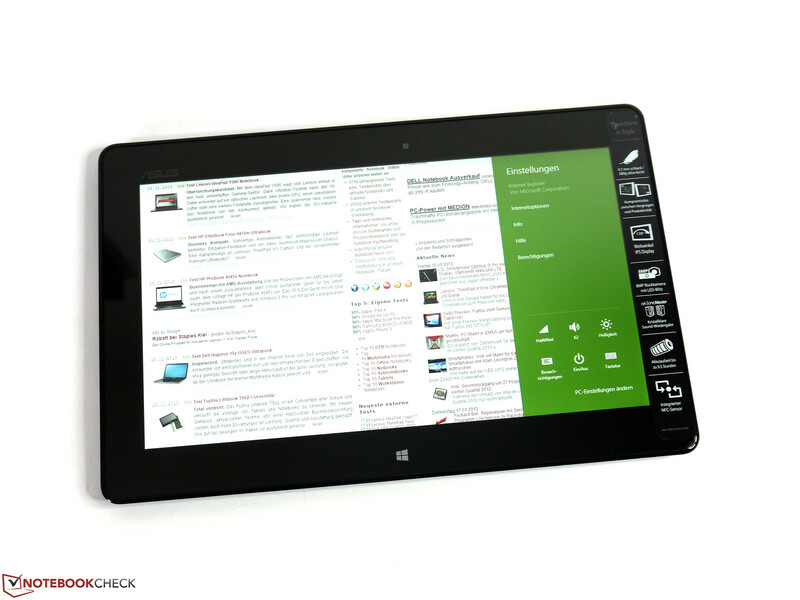 The tablet scores in mobility with a competitive weight, good workmanship and decent stability. The battery runtimes are viable, but lag slightly behind those of the Android or Apple competition. The screen features high contrasts, is viewing angle stable and provides a practical resolution. The maximum brightness is good but could be a bit higher, also due to its reflective surface. The price of 500 Euros (~$668) is quite fair considering the configuration. The operating concept purposely deviates from the pure tablet features of the competition and will unlikely suit everyone. 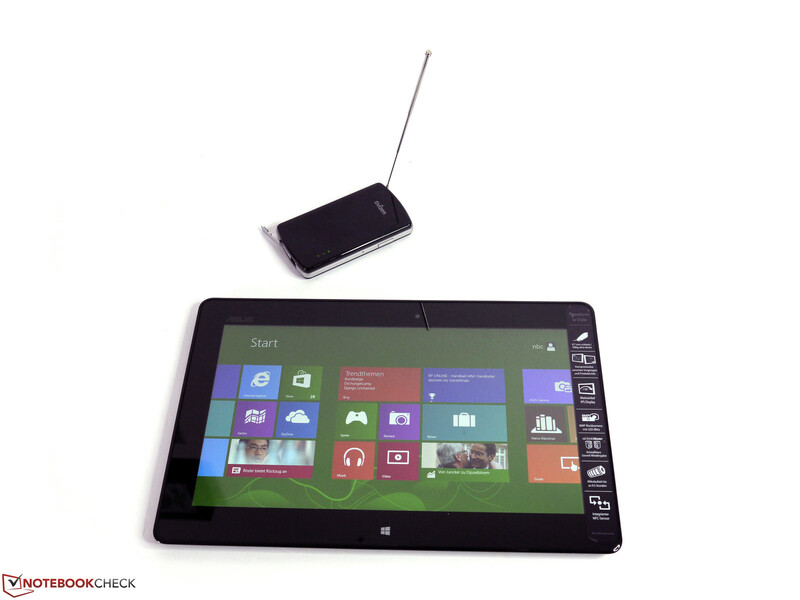 Asus' VivoTab Smart is a tablet based on Windows 8 and Intel's Atom CPU. The HDMI port implemented in a micro format is below a fiddly cover. The sensor button did not always work in the test. 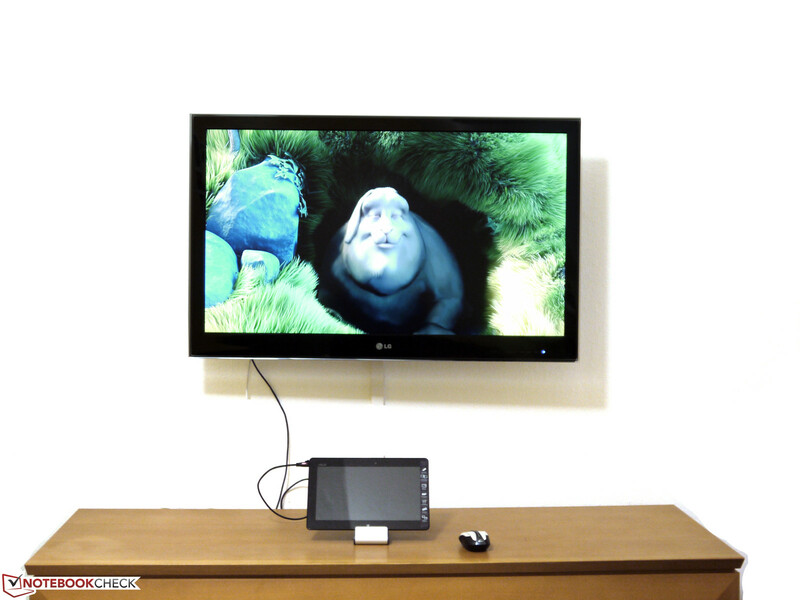 Screen content can be transmitted to an external TV or monitor via HDMI. The tablet's content is displayed in 1366x768 pixels on the external device when mirrored. The tablet's screen is excluded when the Full HD resolution is selected. 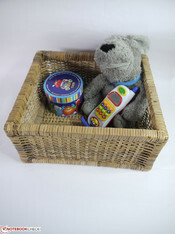 However, a mouse is compulsory in that case. Watching TV is possible via USB dongle and DVB-T stick or much more elegant via Elgato's Tivizen via Wi-Fi. A USB cord is included and is required for connecting the power supply unit. 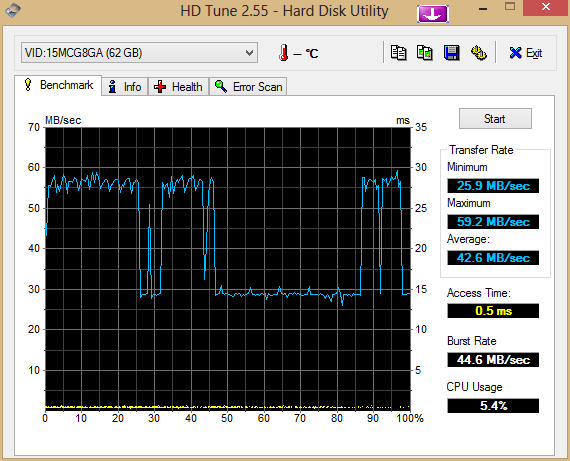 A 1.8-inch hard drive from Verbatim worked flawlessly. Even various USB flash drives, an ATV model in this case, worked without problems. 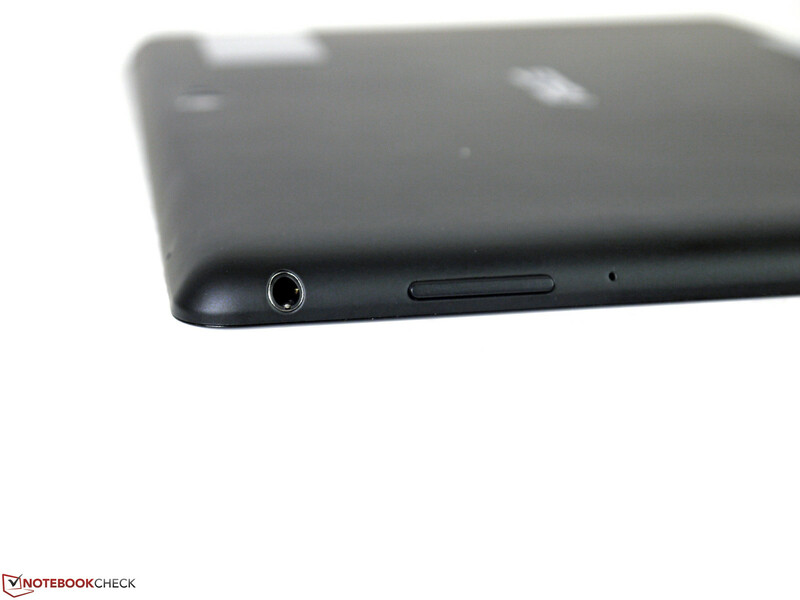 The tablet's back features a pleasant rubber coating and ensures a good grip. 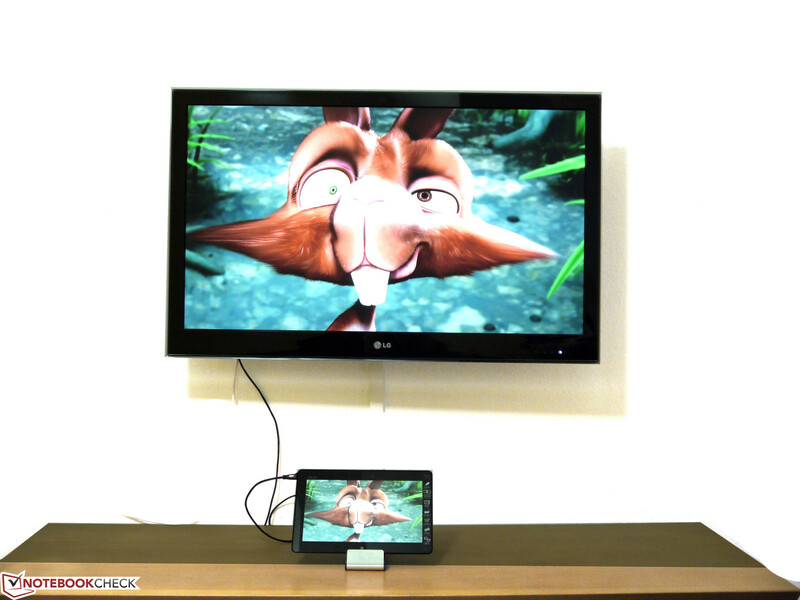 Compared with models featuring a 4:3 format, the 16:9 VivoTab especially shows advantages when playing movies. 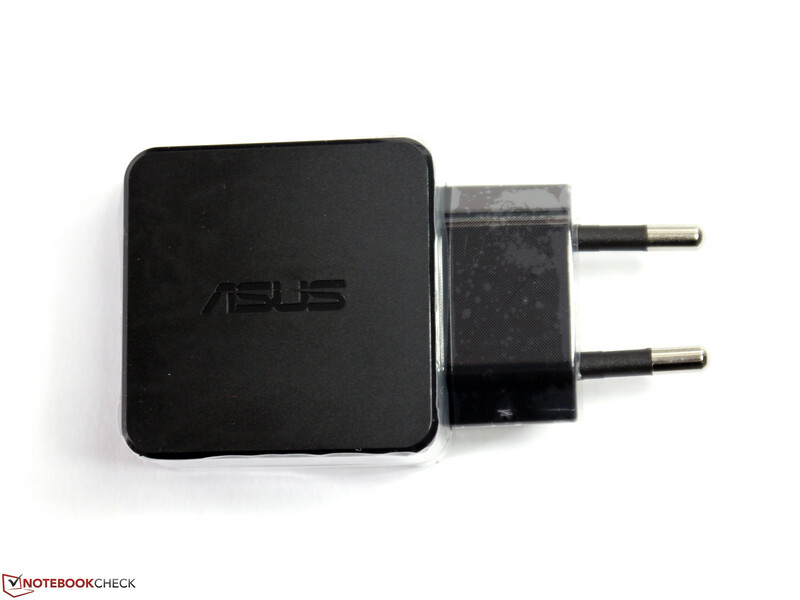 The micro USB port requires an adapter for use with standard USB devices. The Asus logo on the front is very unobtrusive. The Windows logo is a sensor button which enables quickly switching between the desktops. 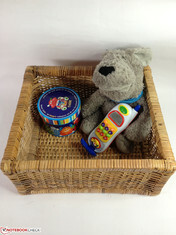 Only the bare essentials are included as accessories. with wide viewing angles and decent brightness. The HD resolution is a compromise of content size and desktop. A large sticker explains the most important features. 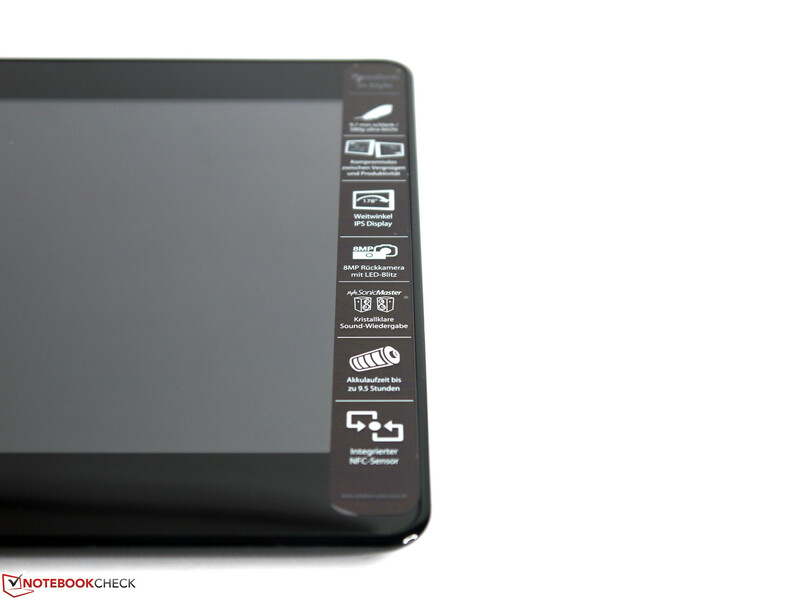 The main differences to the prominent tablet competition can be seen on the back. a somewhat better 8 MP camera is on the back. Microphones or speakers can be connected to the audio port. 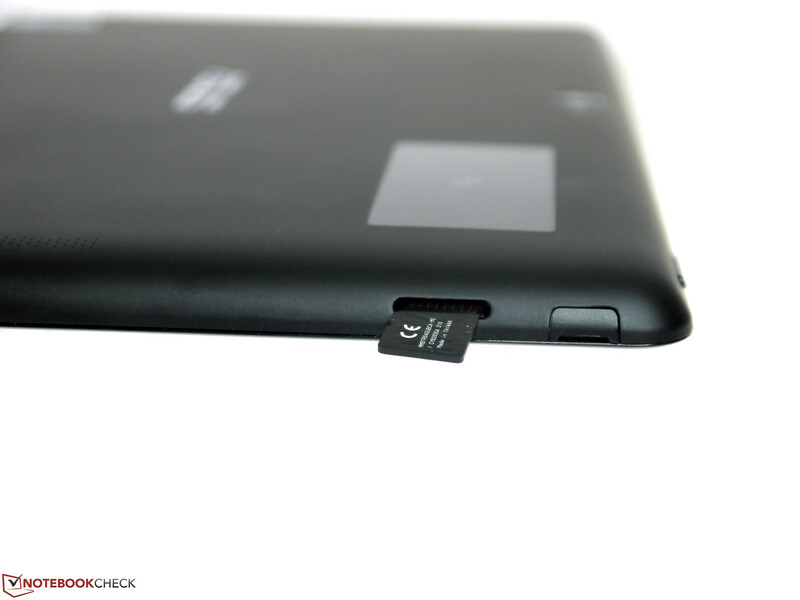 The micro SD card slot features a very tense spring mechanism. The PSU is specified with a wattage of 10 watts. 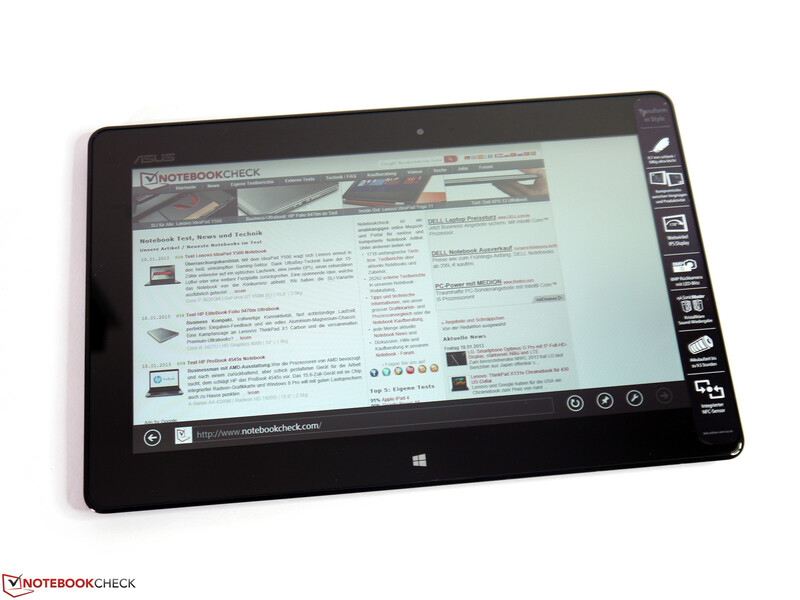 Windows 8 on a tablet. That works quite well and is as functional as a Swiss pocketknife. Matching cords and adapters for the micro interfaces. Also, the graphics solution for Windows 8 could have a bit more power and above all a better compatibility. That many tablet tasks are implemented smoothly and it doesn't need to shy away from comparison with the established competition in many aspects. There is a backlog in the MS Store, where the current offer - putting it kindly - is very small.